When I was a kid, there was no such thing as hair paste or sculpting clay. Your choices were Dep or Royal Crown Sculpting Cream. Royal Crown Sculpting Cream came in this tiny circular canister with a metal lid. Inside, the cream resided, and looked more like a lubrication product for heavy machinery than a hair product. And once you applied it, it felt like lubrication product for heavy machinery. Your hair was basically plastered down to your head and it looked like you were always sweaty (like Don Cheadle) and needed to be smoking a Lucky Strike unfiltered cigarette. And once it was applied, you wouldn’t dare run your hand through it, because it would be fully coated and moist by the time you got to the back of your head. Your look”(think wet, matted-down dog) remained the same throughout the day and left some really questionable ooze on your pillow. A good paste is something that still eludes the majority of companies on the market today. Most of the pastes still don’t have the holding power that makes a paste, a paste. A paste that comes out of a tube is straight up substandard — don’t even waste your time. It will coat your hair, but won’t allow any styling, and generally, your hair lays down flat after an hour or less after application. If you’re in a club or bar and you sweat even slightly, your hair will lay flat, like the Seinfeld episode where Jerry and Kramer switch to low flow showerheads. But the paste from Verb is the real deal, the genuine article if you will. With Brylcreem, another old school product, the old slogan was, “A little dab will do ya.” And it would mat you down, but you wouldn’t be able to style or sculpt your hair. The product from Verb not only allows for the ability to legitimately style your hair, but it doesn’t leave residue or become crusty. The thing that was really cool was the fact that you could re-style your hair throughout the day. Additionally, you (or your special lady) can run your fingers through it and it doesn’t feel sharp, crusty or unwilling to move. Another nice feature is that you don’t have to fully coat your head to spike your hair or sculpt any way you choose. I literally used enough to cover the tip of my index finger and that was enough to keep my look (think Blue Steel) all day. Which also means that you don’t have to buy the product constantly; one circular container would last you several months. And at just $12 per container, it is an absolute steal. 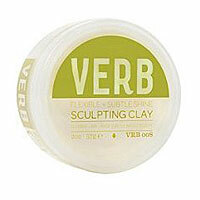 Check out the Verb Sculpting Clay in addition to other products from Verb.